The Launching of the Grooming Blueprint | New Growth Hair Magazine | We capture the culture of urban barbershops and beauty salons. About two months ago I woke up with an idea to provide haircuts for boys and youth who either have been on their excellence grind or just need a little push through some rough patches in their development. It was one of those dreams you come out of and know that this is it. It was what I had been waiting for…a sign to grow, a message to be inspired. To me, the idea was simple, yet it was so profound that it made me sit up and immediately start planning and plotting. I talked to my wife about it and we came up with, The Grooming Blueprint. Seventy Sixes barbers will be giving haircuts, grooming classes and grooming kits to boys in-and-around Newark. We’re starting off with a summer initiative called, Give-Back, Get FRESh,in which we are aiming to provide 500 FREE haircuts from May 20 to August 31. 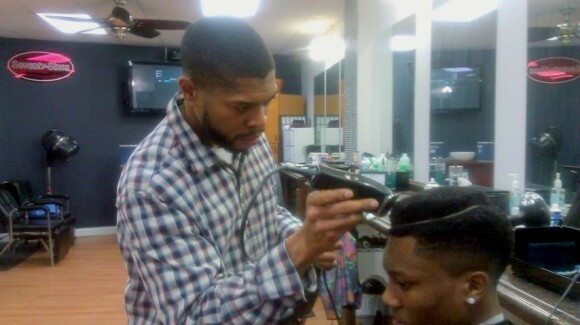 The beauty of The Grooming Blueprint is that so many of my customers work with Newark boys and teens or volunteer at organizations that service our young men. My clients haven’t stopped giving me contacts and have pledged to help any way they can. They all agree that there is a serious gap in mentoring and preparing young men into adulthood; especially around presentation and grooming. However, I NEED YOUR HELP. Big time. We are raising money to fund this campaign and every dollar helps. Our goal is to raise $5,000 by May 18, 2013. Seventy Sixes will be hosting a wine & beer tasting fundraiser, Saturday, May 18 from 6PM-9M at Savion Glover Productions, 131 Brunswick Street 07114. The event cost is $35. The event space was donated by internationally known tap dancer and Newarker, Savion Glover. The space is hot and it took Sav (that’s what we call him) about four years to renovate. I’ve been knowing Sav for a minute and recall when we used to spit rhymes 15 or more years ago with my brother. Now we are fathers and life has changed. We laugh at how we’ve evolved, and I am grateful we are on the same page to help out the young ones coming up behind us. The biggest lessons have taught me that small gestures, such that of grooming someone can change their confidence and take the day’s weight off of their shoulders. So starting on May 20, we are cutting heads for prom, graduation, sports banquets, summer vacation, job interviews or just on a day where a young man needs to get a “good look” and get cleaned up. Another aspect of The Grooming Blueprint is our commitment to service special needs students. My mother was an educator at John F. Kennedy on 10th Street for years, and I had the honor of cutting some of her students for their prom. I am pushing to start that back up. Also, I have to admit that this idea is an extension of a proposition by one of my clients who works at a successful non-profit. Last year he wanted to enter into a partnership where I would be providing free haircuts to the boys who were involved with his organization. With great regret, I had to decline. I was so green in my business that I didn’t know if I could do it. Still, there are quite a few things that I would like to have in place before I embark on this campaign; but I have this thing in my spirit that is telling me to go. To do this. I have found out that leaping out of the window without a parachute, but equipped with all heart, passion and laser focus can land you right where you need to be. This post was written by the authors of The Grooming Blueprint Online.